Big noisy exhausts, sporty spoilers and booming subwoofers… one driver’s dream machine is another’s breach of the peace. But when does a car modification become illegal? Our essential guide sorts the law-breakers from the nuisances. A car modification is classed as any change made to a vehicle that enhances it in some way and isn’t part of the original manufacturer’s specification. People mostly make modifications to cars to improve their aesthetics or performance. The most common modifications made to cars include louder exhausts, tinted windows, neon lights, and enhanced sound systems. With many cars, it’s obvious to tell that they’ve been upgraded but with others it isn’t, so be careful if you buy a second-hand vehicle, as it can invalidate your insurance if you fail to disclose a modification on your policy. Let's take a look at some of the more common car mods and investigate what effect they have on the car and whether they are breaking any laws. Some drivers soup up their exhausts to boost the sound of their car’s engine, but this can be a public nuisance. Most big-bore and sports exhausts are not legal on public roads in the UK due to their excessive noise levels and extra emissions. 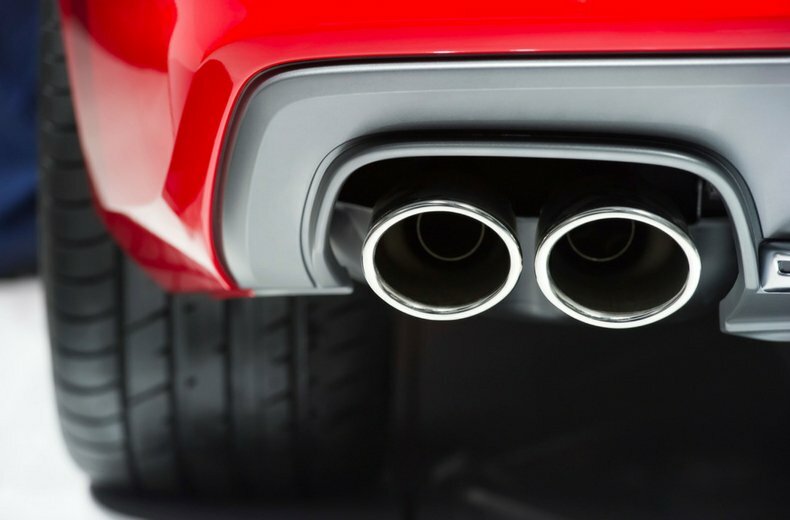 Drivers caught with an excessively noisy exhaust may receive an on-the-spot fine of £50, and could have their car taken off the road until the offending exhaust is removed. Filters and turbos are permitted but the car must pass an MOT emission test. Tinted windows are legal as long as they meet certain criteria – drivers could be breaking the law if they go too dark or tint the wrong windows. 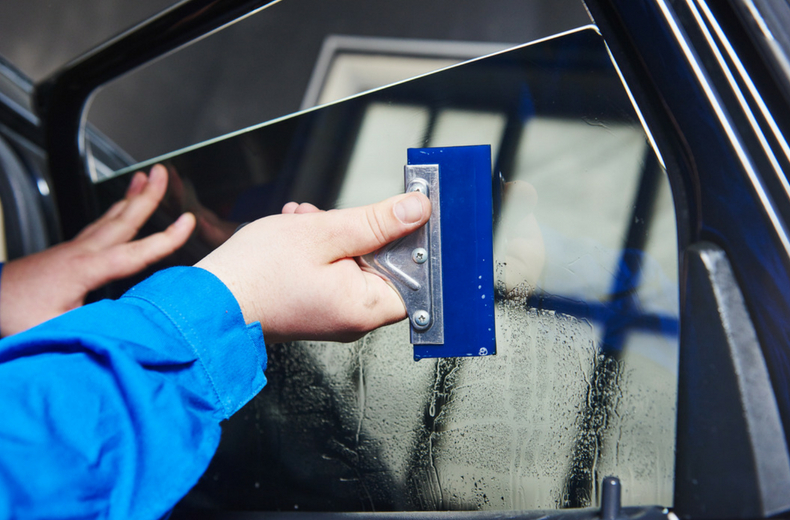 There are no restrictions when it comes to tinting rear side windows and the rear windscreen, but limits apply to tinting the front side windows and front windscreen. By law, the front windows have to let a minimum of 70% light through, and a minimum of 75% through the windscreen. This is to ensure visibility isn’t obscured. Motorists who fail to comply with these rules could be served with a prohibition notice, meaning they won’t be able to use their car until the tints have been removed. In extreme cases, a penalty notice or even a court summons could be issued. The main appeal of spoilers is to give a car a sportier appearance and provide better handling when travelling at high speed. 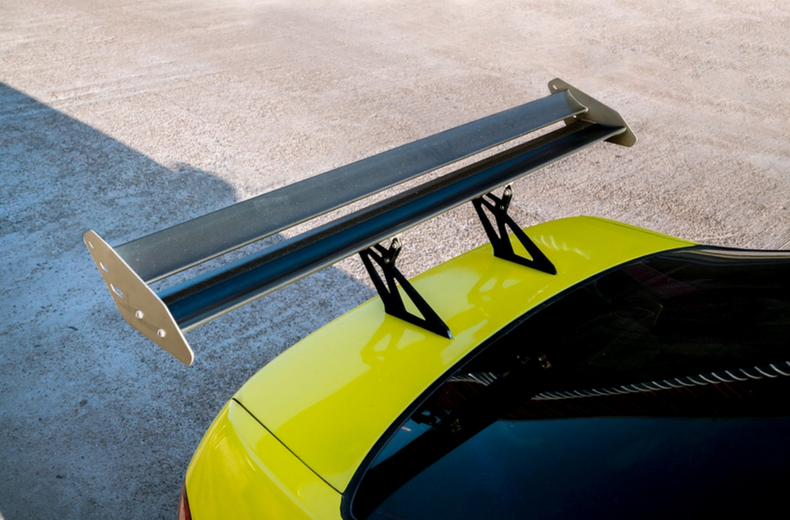 A spoiler must be securely fitted to the bodywork to make sure it won’t detach when being driven. It shouldn’t have any dangerously sharp edges or obstruct the driver’s view. Ever mistaken blue lights on a modified car for an emergency vehicle? Neon lights can be a nuisance, and they’re almost exclusively illegal when fitted on regular cars. The law states that only white lights can be fitted to the headlights at the front and red lights to the back of the car. Any other colour is not allowed. Tinting of these lights is also not permitted as it reduces the amount of light emitted. Flashing lights are only allowed on emergency or recovery vehicles, while green lights can only be fitted to medical practitioners’ vehicles. 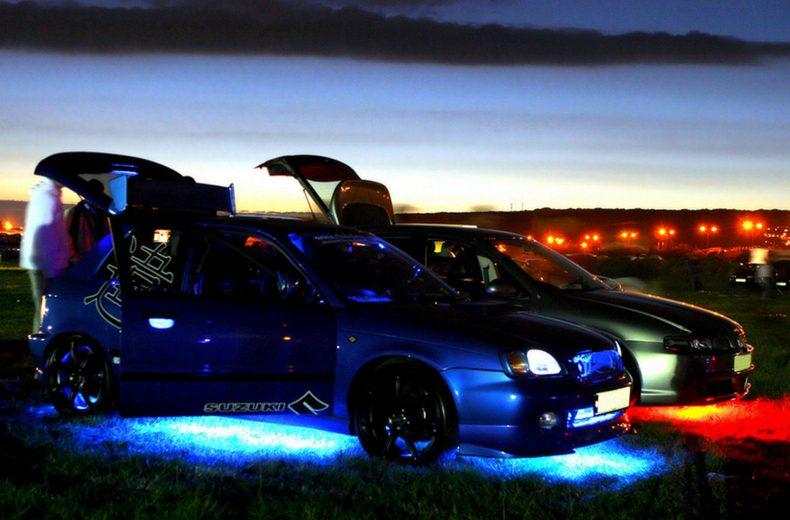 Neon lights can be fitted underneath a car, although the tubing must not be on show as this is also illegal. Playing music too loudly from a car stereo can lead to drivers receiving a warning from the police. If they ignore the warning, they may have their vehicle seized or audio equipment confiscated. So if you’re plagued by motorists tearing around your neighbourhood with their stereo blasting out, you can make a formal complaint. The law states that the police can seize a vehicle that is causing “alarm, distress or annoyance” to members of the public. Lowered cars are not necessarily breaking the law, but they may attract the attention of the police. A car can be lowered but it must not interfere with the steering or affect the height of the headlights. Suspension mods should always be carried out by a competent mechanic and components should never be cut and welded together as this can make the car dangerous to drive. Also, a lowered car may struggle to get over speed bumps, which could result in serious damage to the underside of the vehicle. 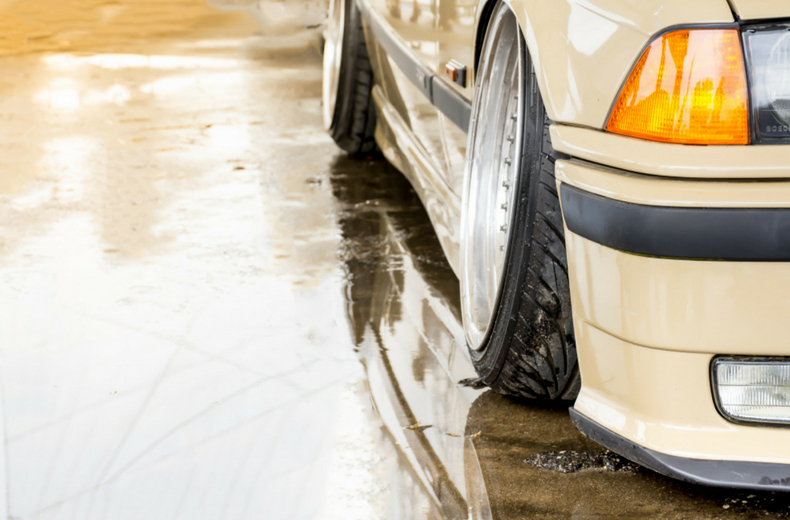 How do modifications affect car insurance? Most modifications that change the look and performance of a vehicle will increase the cost of cover. Those considered a higher accident risk include engine changes, sports seats, body-kits and spoilers. Some modifications, such as phone kits and DVD players, increase the chance that a vehicle is broken into or stolen. However, some modifications can reduce premiums. Changes that improve the security of your vehicle, such as immobilisers, could bring down the cost of car insurance. Parking sensors could also lower your premium as they mean you’re less likely to have a prang when reversing, while fitting a tow bar signals to insurers that you’re more likely to drive at a moderate pace as you’ll sometimes be hooked up to a caravan or trailer. You must always tell your insurance provider if you’ve modified your vehicle in any way. If you don’t, your insurance could be invalid, and you could be unable to make a claim. READ NEXT: Driving without shoes – is it illegal? Do you remember these six dead driving practices?